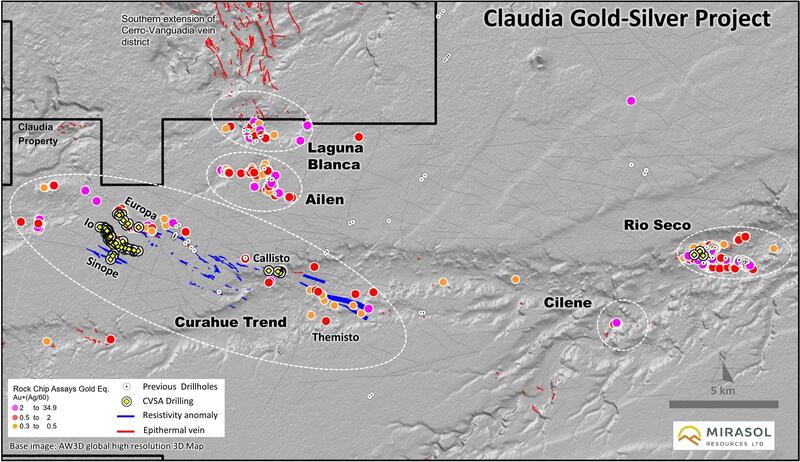 The extensive Claudia Gold-Silver Project has five epithermal prospects with multiple drill-ready targets. 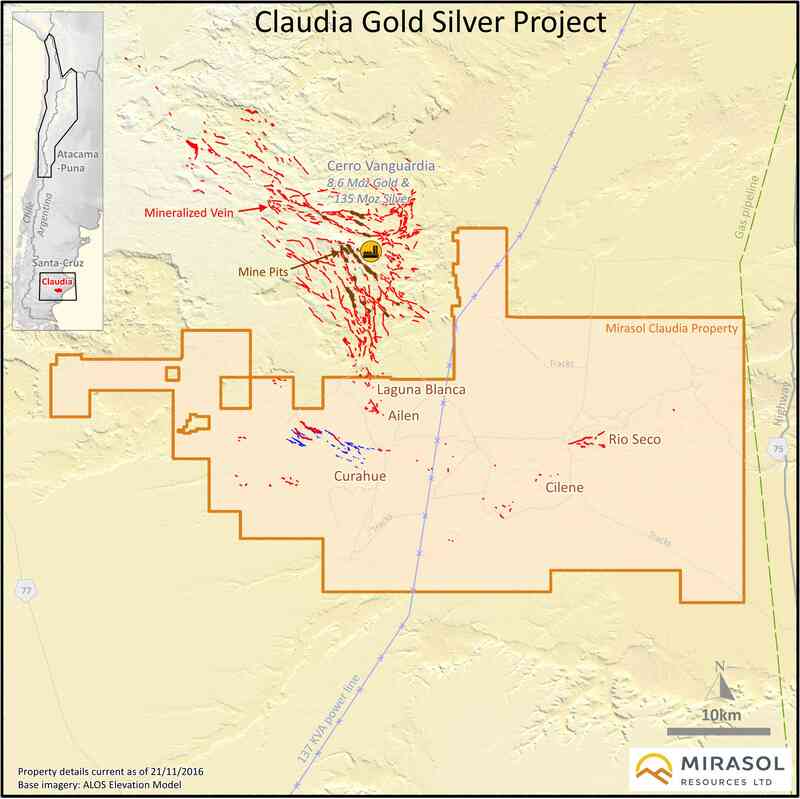 The Claudia project was staked in 2004 as part of Mirasol’s Santa Cruz project generation strategy. Following up reconnaissance targets identified additional mineralization centres that led to more staking and the establishment of a sizeable land position. In 2012 Mirasol discovered the large 15 km long Curahue vein trend that had until that time been hidden by thin gravel cover. 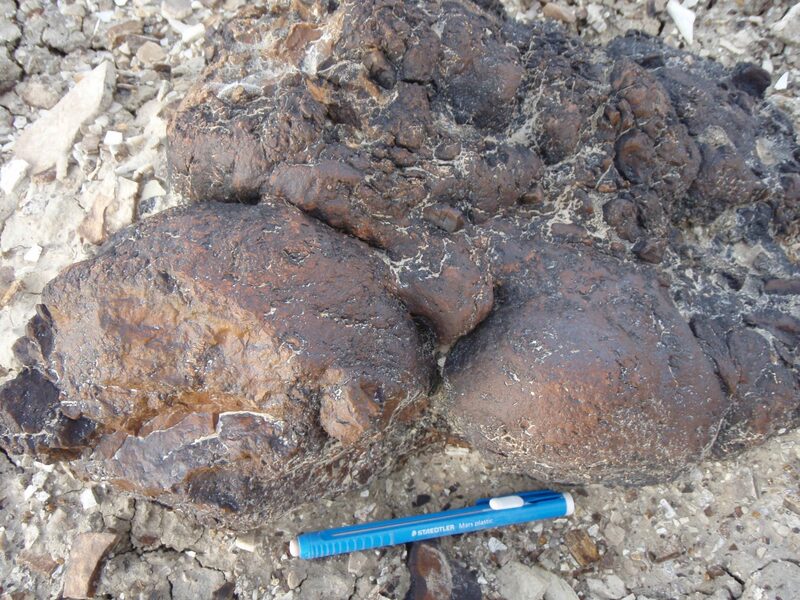 At Curahue, Mirasol has identified six large vein trends. The Claudia prospects lie between 15 and 35 km to the south of the Cerro Vanguardia mine which adjoins the Mirasol claims. 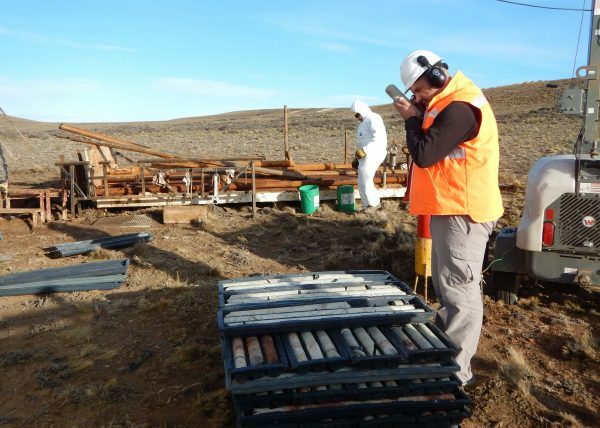 The world-class Cerro Vanguardia gold-silver mine (owned by CVSA, a joint venture 92.5 % owned by AngloGold Ashanti and 7.5 % by Fomicruz S.E., the Santa Cruz provincial mining company), has total district resources and past production of 8.9 Moz gold and 137 Moz silver. 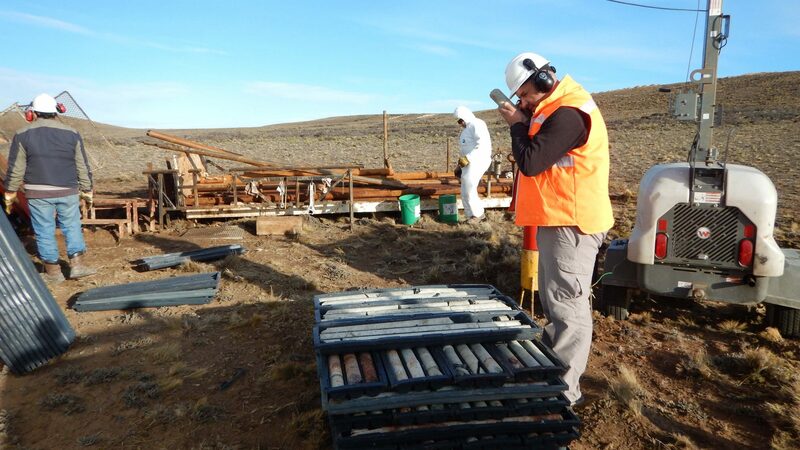 During the Claudia option agreement with OceanaGold (October 2017 to March 2019), OceanaGold has invested C$2 million and drilled 2,500m in 12 holes. 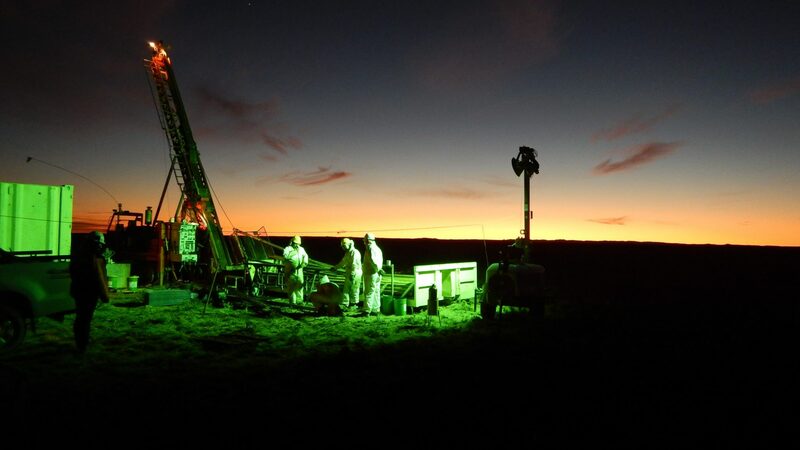 Over the current exploration season, Mirasol also completed additional surface exploration and geophysical surveys on the project to define new drill targets which have not yet been tested. In addition to the exploration expenditures incurred to date, OceanaGold has also made approximately C$250,000 in option payments to Mirasol. From February 2016 to January 2017, Mirasol was in a joint venture with CVSA which completed 7,525 m of reverse-circulation (RC) and diamond core (DDH) drilling at the project. 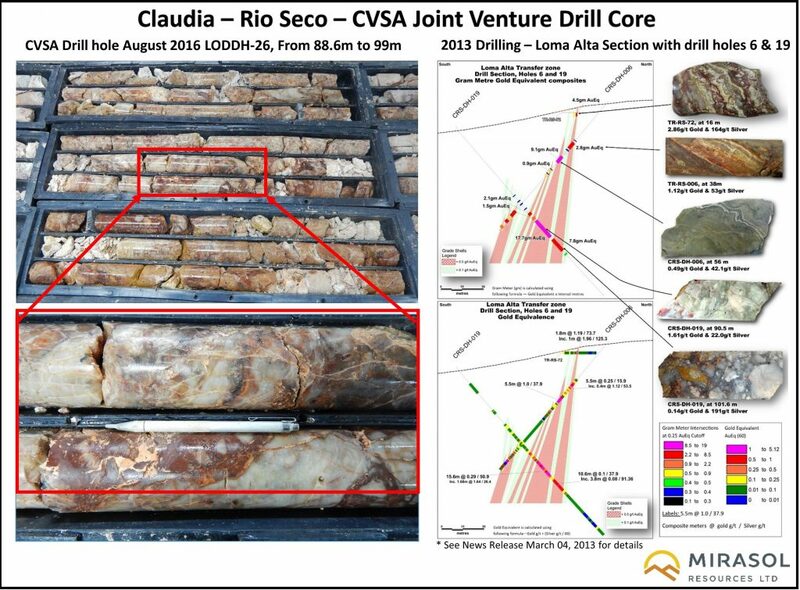 The drilling was mostly focused on the Io vein, a 2.2 km long vein zone in the Curahue prospect and outlined a body of gold and silver mineralization. During the OceanaGold agreement, 12 DDH holes totaling 2,529 m have been drilled, testing targets at the Curahue and Cilene prospects. 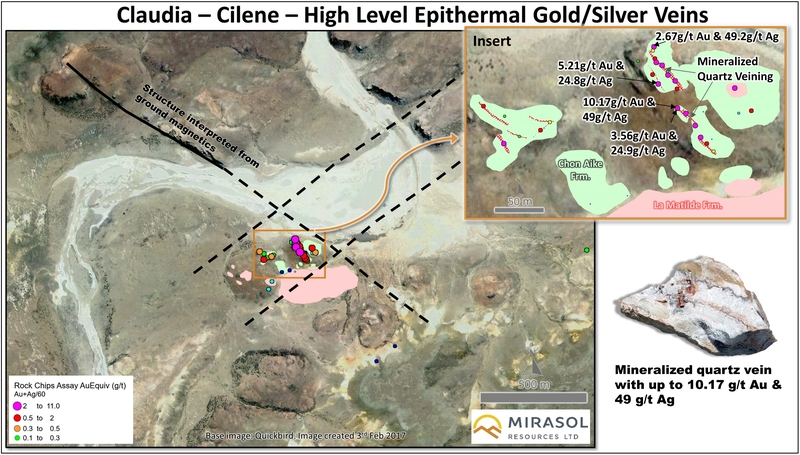 Assays from the Curahue prospect, Europa and Io trends include 0.6 m at 0.08 g/t Au and 610.0 g/t Ag, and 0.55 m at 1.15 g/t Au and 22.9 g/t Ag; and from the Cilene prospect 0.9 m at 1.95 g/t Au and 5.7 g/t Ag. Integrated analysis of the data generated to date is providing new geological insight into the controls on mineralization at the Curahue and Rio Seco prospects. 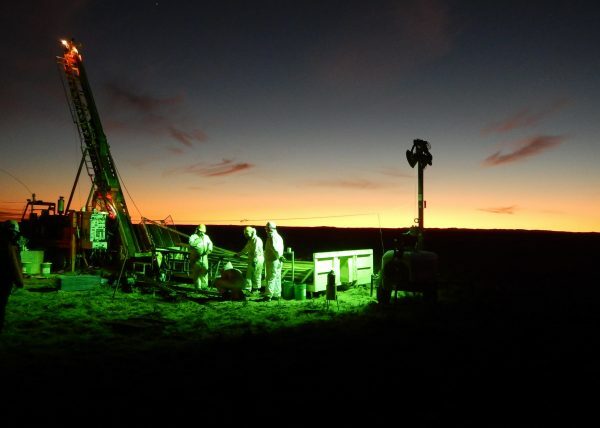 Mirasol has defined new drill targets which have not yet been tested. Detailed results from the 2017/2018 programs were published on September 17, 2018. Results from the 2018/2019 work will be announced shortly. 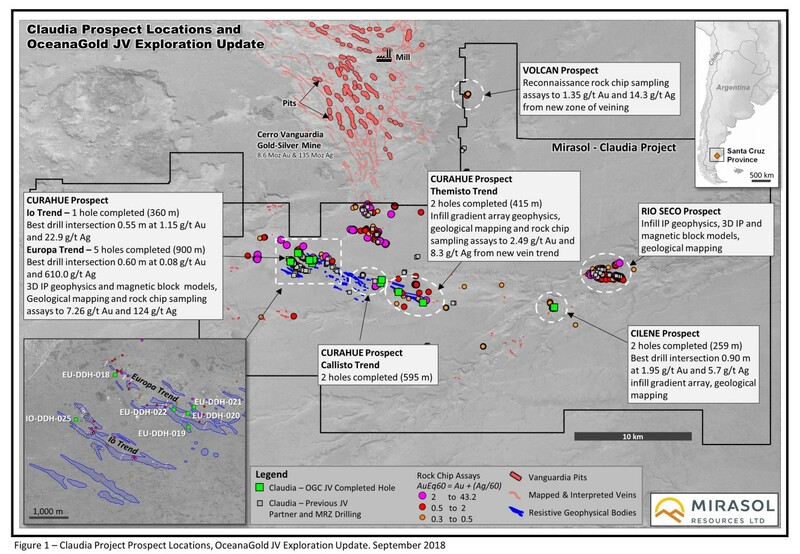 Drilling from last year's exploration, completed to July 2018, was focused at the Curahue Prospect, with 10 DDH holes drilled totaling 2,270 m, to test targets on the Europa, Io, Themisto and Callisto Trends (Figure). Drilling at Europa intersected zones of epithermal veins, veinlets and silica-sulfide structures up to 13.7 m wide (downhole, with 10 to 90 % veining) in three of the holes drilled. The veins and silica-sulfide structures are hosted in what is interpreted to be the upper part of the Jurassic-age Chon Aike volcanic sequence. 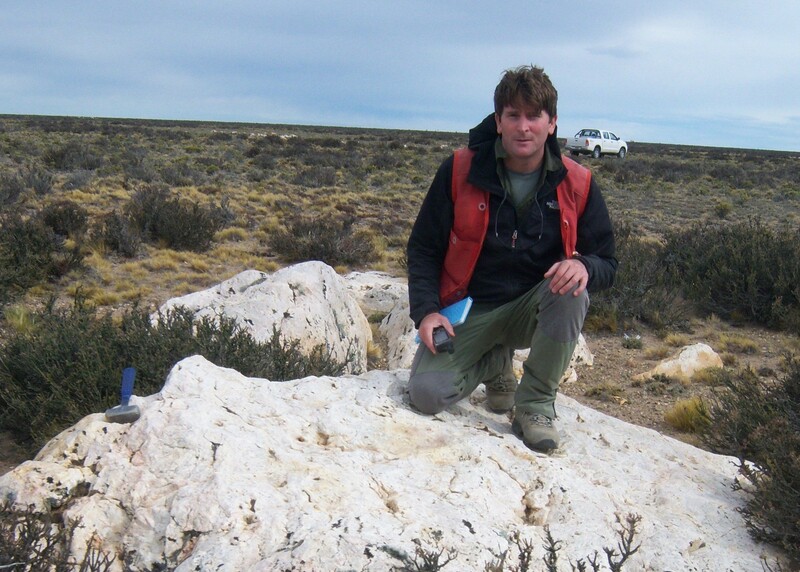 At the nearby multimillion ounce Cerro Vanguardia Au+Ag Mine, the distinctive Granosa Ignimbrite unit of the Chon Aike volcanics is the primary host to the majority of ore grade veining. 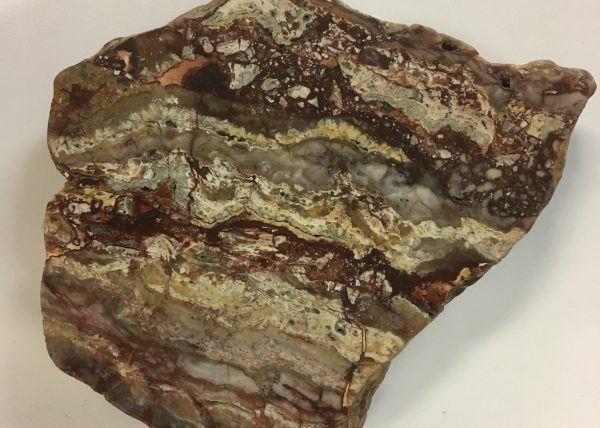 The Granosa Ignimbrite is a brittle, densely-welded volcanic that is an optimal host rock for vein formation. Vein widths and grade typically significantly improve where veins are hosted by the Granosa when compared to the same vein hosted by overlying less competent volcanic units1. 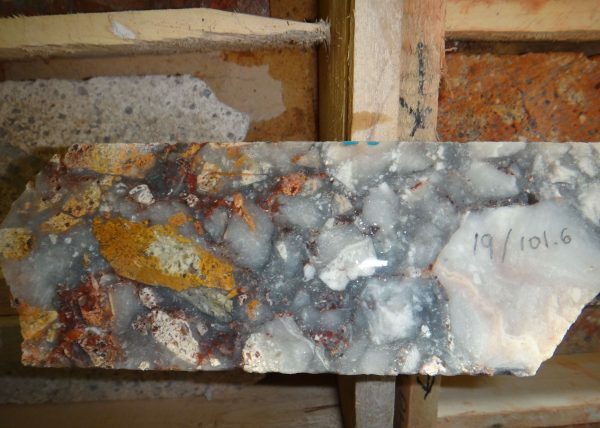 The Granosa unit is interpreted by Mirasol geologists to occur stratigraphically below the current depth of drilling at Europa, Io and Themisto. The intersection of these vein zones with the Granosa unit may represent a target for further drilling in the Curahue prospect. 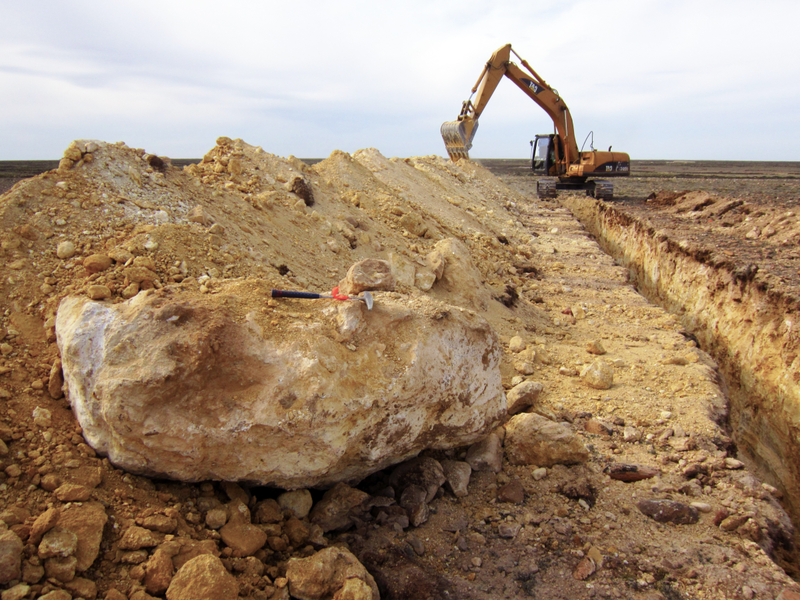 Five DDH holes were drilled into the 2.9 km long Europa Trend to test covered geophysical targets beneath post mineral unconsolidated gravel and a large alluvial terrace composed of cobble to boulder-size clasts of epithermal vein material. 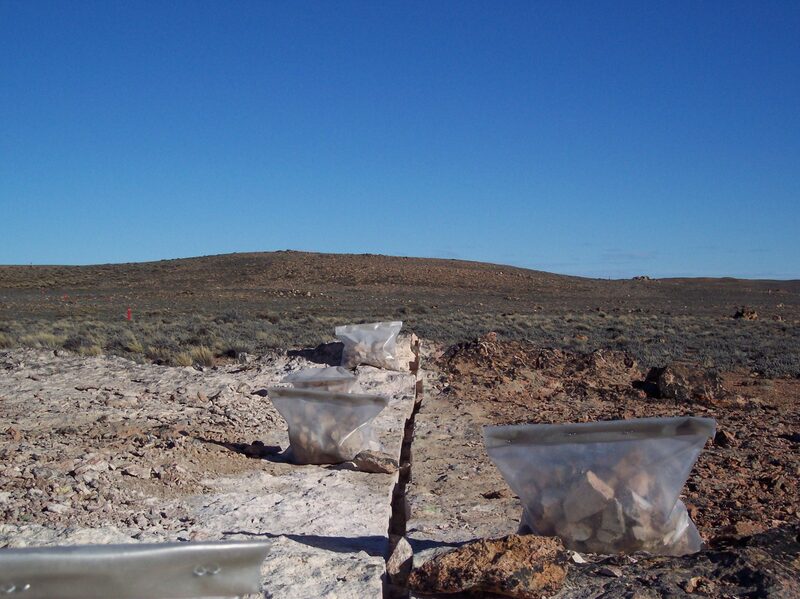 Previous rock chip sampling of the epithermal clasts in the alluvial terrace returned assays of up to 1.66 g/t Au and 2,130 g/t Ag. Reinterpretation of drilling at Europa by a previous JV partner suggest these holes were predominantly drilled into the hanging wall of the target structure or intersected mineralized vein boulders in the alluvial terrace over lying the volcanic host rock and so that were not testing outcropping veins. Assay results from the Europa drilling returned anomalous Au+Ag (Table) with strong epithermal path finder elements (As, Sb). 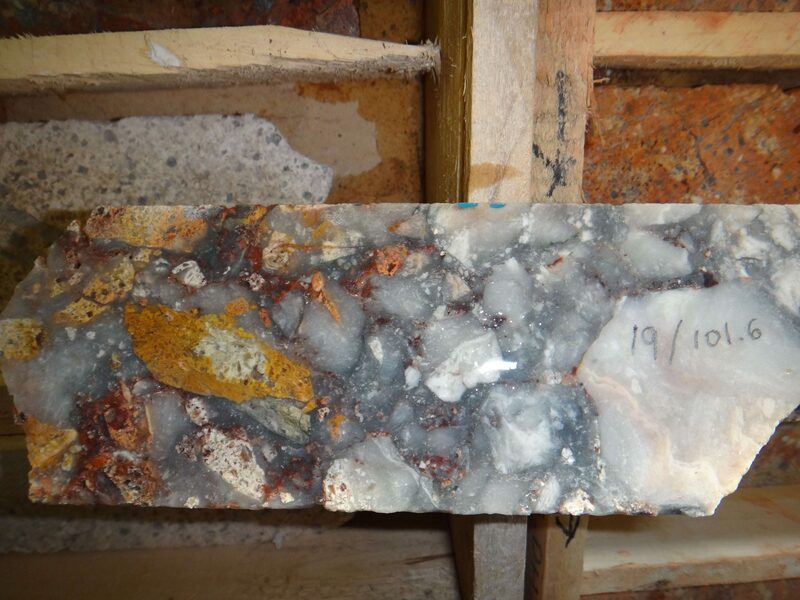 Assays include a best downhole intersection of 0.6 m at 0.08 g/t Au and 610.0 g/t Ag from a silica-sulfide structure. These exploration results have advanced the geological understanding of this trend, with Au+Ag bearing veins and mineralized structures in the host volcanics now confirmed at Europa. 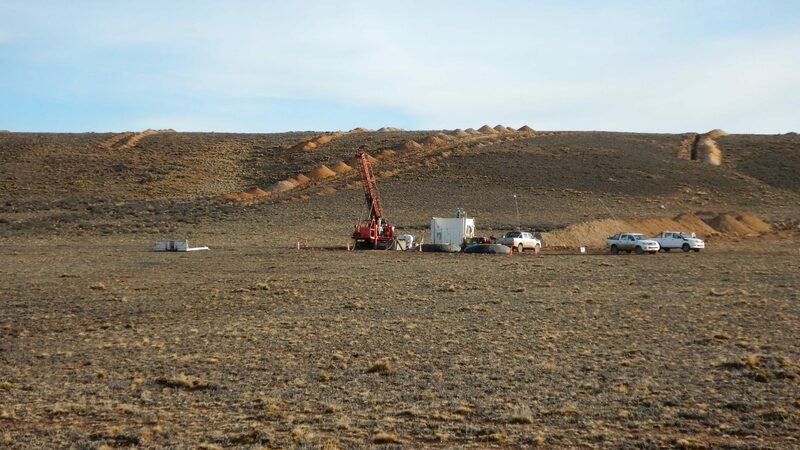 One DDH core hole of 360 m length was drilled at the Io Trend to test at depth beneath the previously reported Au+Ag drill intersections (see news release December 16, 2016; holes IODDH-1, 19 and IORC-26). At 254 m (down hole / approx. 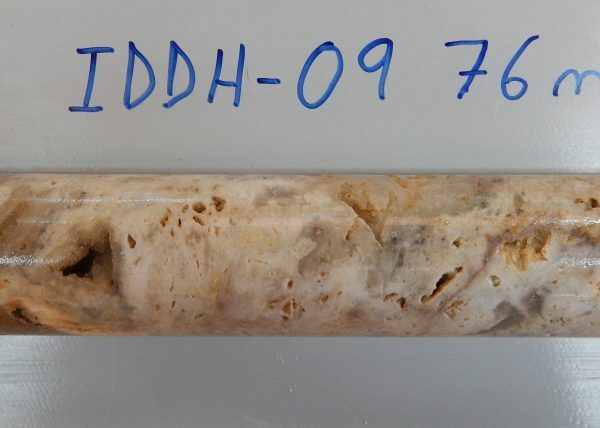 220 m below surface), drilling intersected a 40 m wide (down hole) zone of veining and veinlets (with logged sample intervals between 3 to 95 % veining). 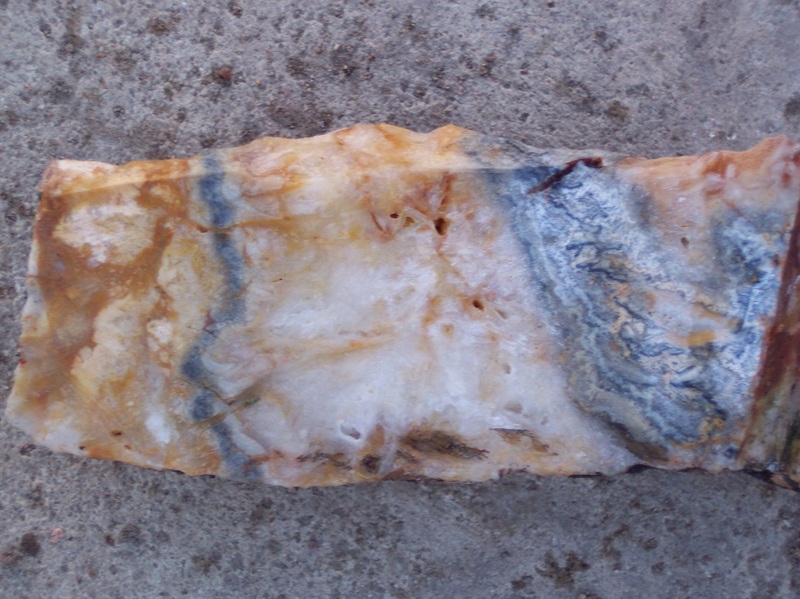 This veining is interpreted to be the down-dip extension of the Io vein zone. This zone assayed weakly anomalous Au+Ag mineralization with a best intersection of 0.55 m at 1.15 g/t Au and 22.9 g/t Ag. 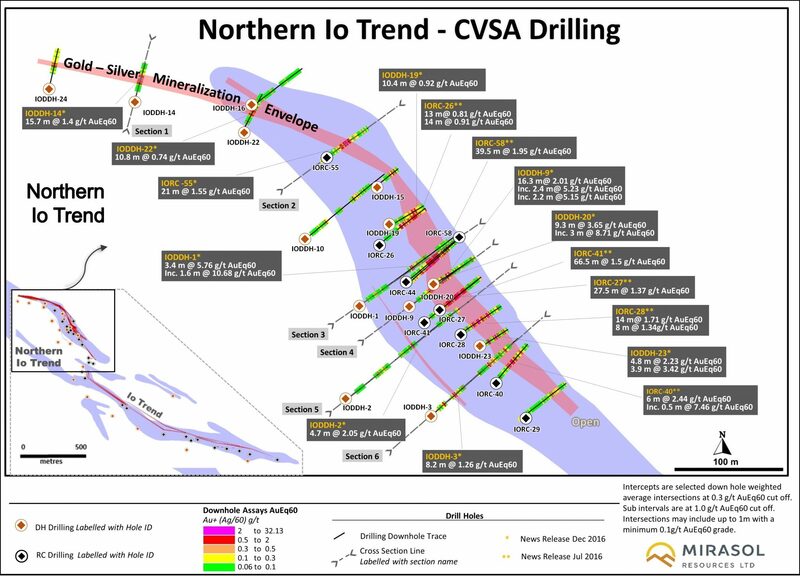 Two DDH holes totaling 415 m were drilled at the 3.8 km long Themisto Trend as an initial shallow test of multi-kilometre long IP and gradient array resistivity anomalies that are locally associated with subcropping chalcedonic veinlets that assayed up to 0.49 g/t Au and 3.6 g/t Ag. A number of low-temperature epithermal veinlet zones 6.9 to 32.7 m wide (downhole), with 5 to 10 % veining, assayed weakly anomalous Au+Ag and strong epithermal path finder elements (As, Sb). 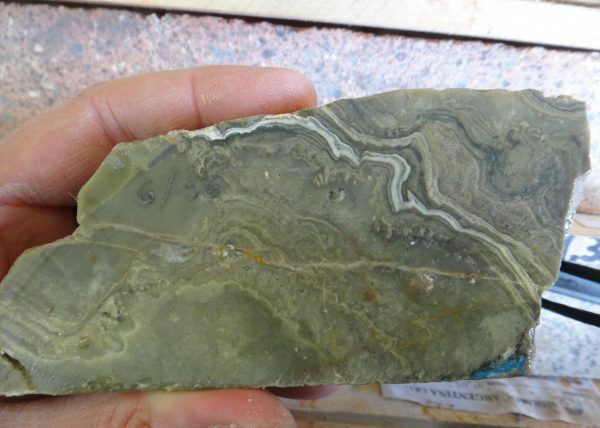 The drill intersections of veining confirm the electrical geophysics anomalies at Themisto are mapping the presence of a strike extensive veinlet zone that may warrant deeper drill testing for improved vein development and higher Au+Ag mineralization. 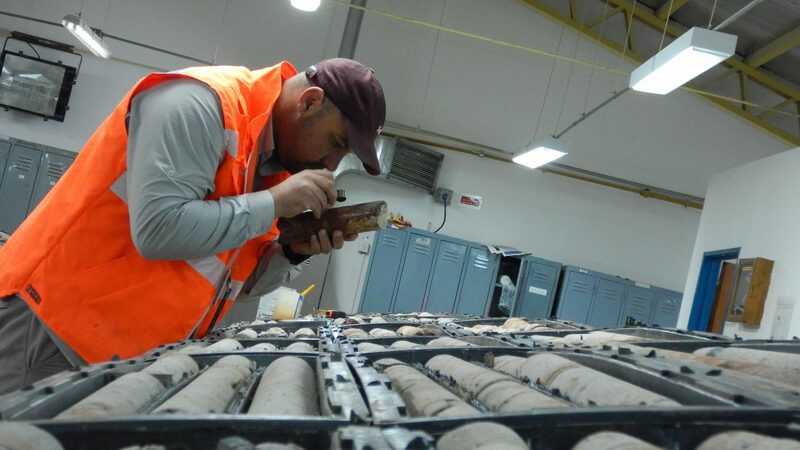 Two holes totaling 595 m were drilled at the Callisto Trend to test coincident low-level Au+Ag and epithermal path finder anomalies in trench channel sample assays. Zones of low intensity silica veining with weak Au+Ag and elevated Sb and As, were intersected. No further work is planned at this prospect for the coming field season. 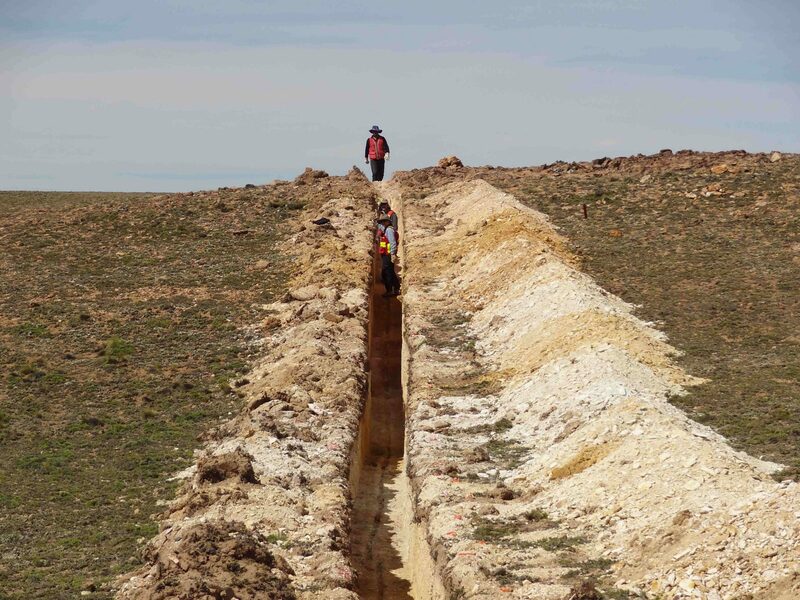 Two DDH holes totaling 259 m, were drilled on one section at the Cilene Prospect, that test 10 to 20 cm wide outcropping veins with select rock chip assays ranging up to 10.17 g/t Au and 49.0 g/t Ag, to a maximum depth of 75 m below surface. The best drill intersection in the deepest hole (CIL-DDH-002) was 0.9 m at 1.95 g/t Au and 5.7 g/t Ag. 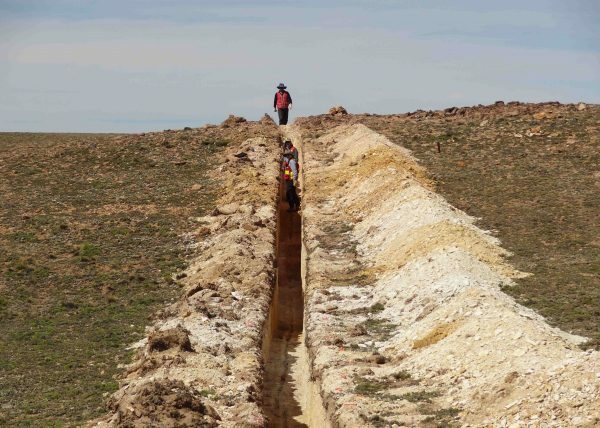 In conjunction with the drill program, geological mapping, prospecting and a total of 114.5 line-km of new and infill IP and gradient array electrical geophysics surveying was completed at Curahue, Cilene and Rio Seco prospects. 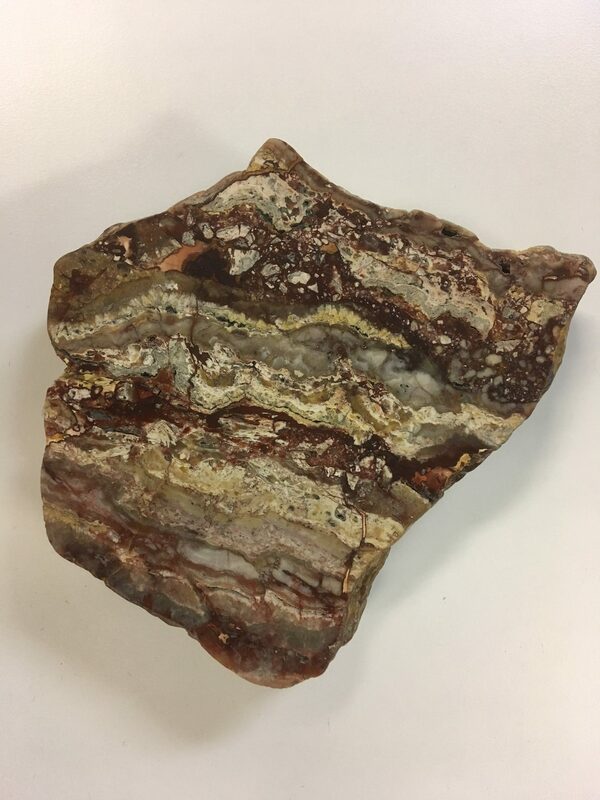 3D geophysical block models were prepared from Mirasol’s existing detailed ground magnetics surveys, and from the combined new and previous Mirasol IP surveys for the Io – Europa section of the Curahue prospect and the Rio Seco prospect. 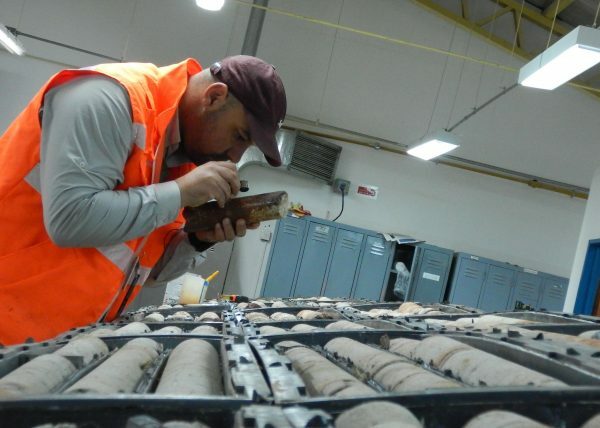 The geophysical models, when analyzed in conjunction with the accumulated geological, geochemical and drill hole database have provided an improved understanding of the geological setting and large-scale structural controls on mineralization at these prospects. 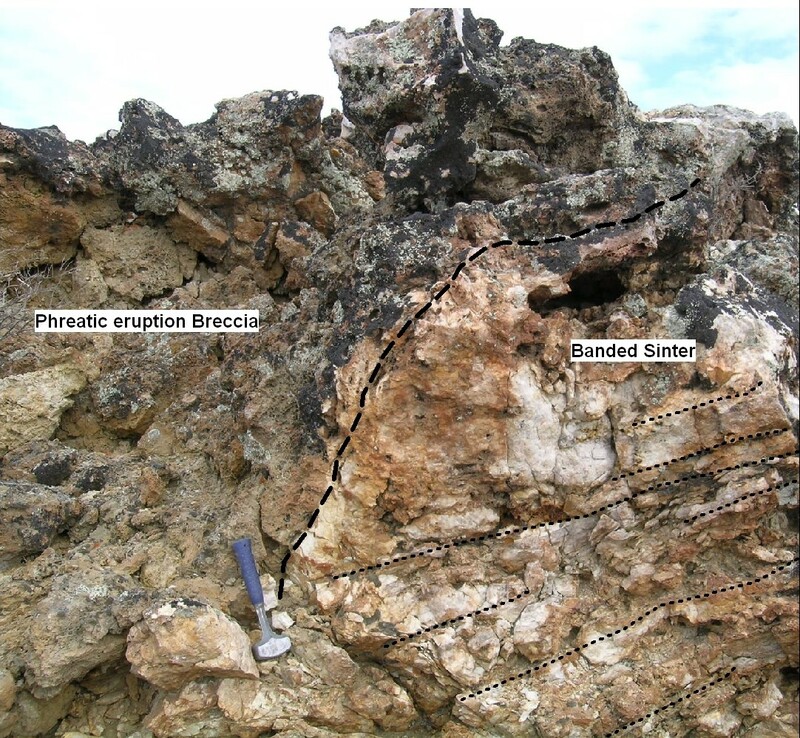 Analysis has outlined a district-scale horst and graben structural setting, identifying large NW-oriented normal faults that appear to have acted as hydrothermal fluid conduits and may potentially also influence mineralized vein development. 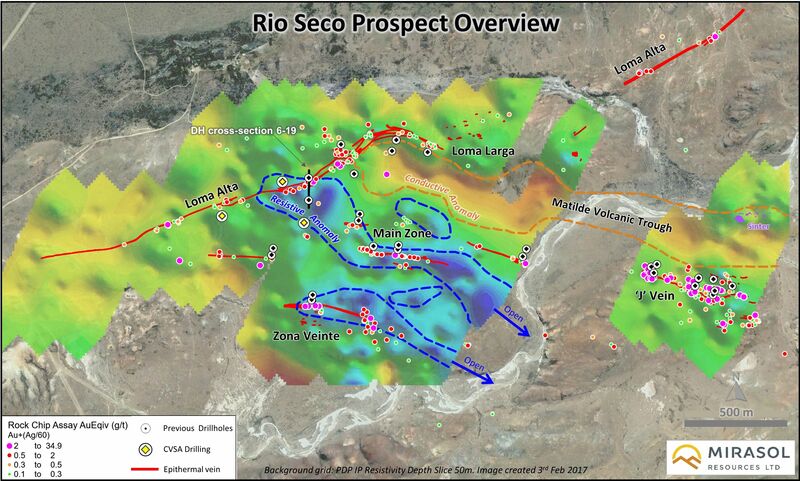 At the Rio Seco prospect the magnetic and IP models when combined with geology and previous drill results, outline a series of priority targets where the prospective Granosa host rock is known to be present; coincident with evidence of undrilled epithermal veining and/or geophysical anomalies and large-scale faults. At the Io – Europa trends integrated analysis of the magnetic model and existing geological and geochemical datasets have identified a large graben-bounding normal fault to the north of the Europa Trend. 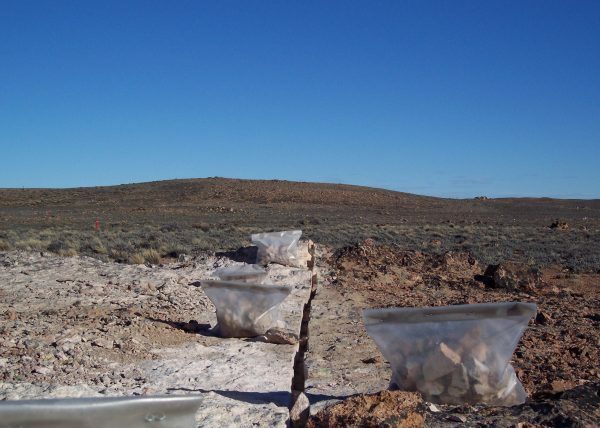 There has been no previous drill testing of this fault zone; however existing drill and rock chip geochemistry suggest mineralization vectors towards the fault trace. 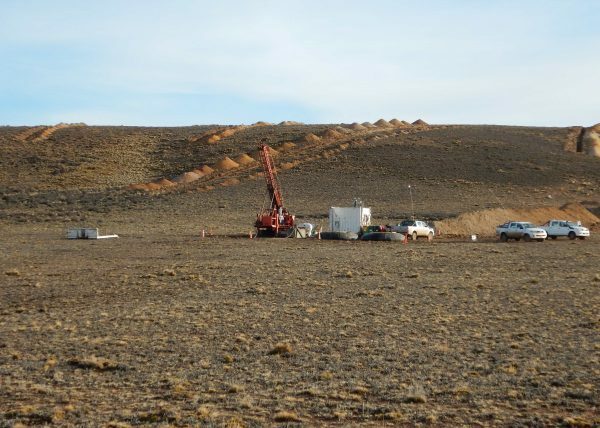 A gradient array geophysical survey which covers part of the fault zone has outlined a series of resistivity and chargeability anomalies within the fault trace, that may represent potential drill targets. 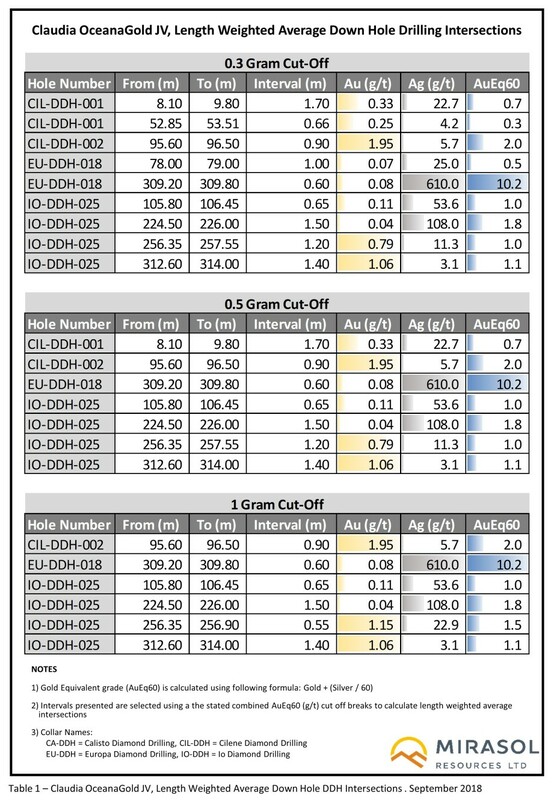 Surface prospecting of the Europa Trend has returned Au+Ag anomalous rock chip assays including a peak assay of 7.26 g/t Au and 124.0 g/t Ag (with the previous best rock assay from the Europa Trend of 4.09 g/t Au and 127.0 g/t Ag) from epithermal vein blocks up to 0.6 m in size, suggesting the blocks are sourced from a larger covered vein. These results indicate a potential extension of the Europa Trend to the SE into an area that has not been previously mapped nor drill tested. 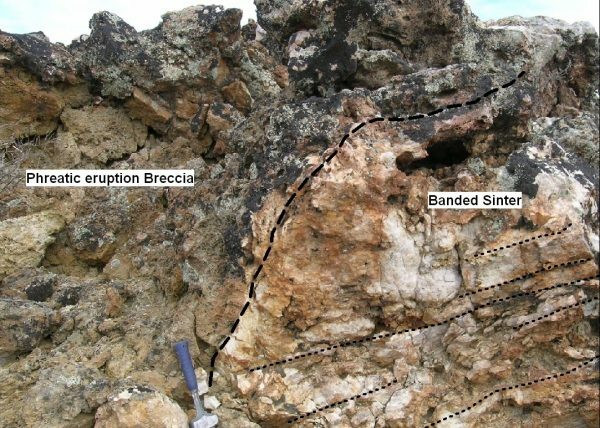 Prospecting to the north of the Themisto Trend has identified narrow (cm wide) epithermal veinlet trends in outcrop that to date have been traced intermittently for a 250 m strike length. 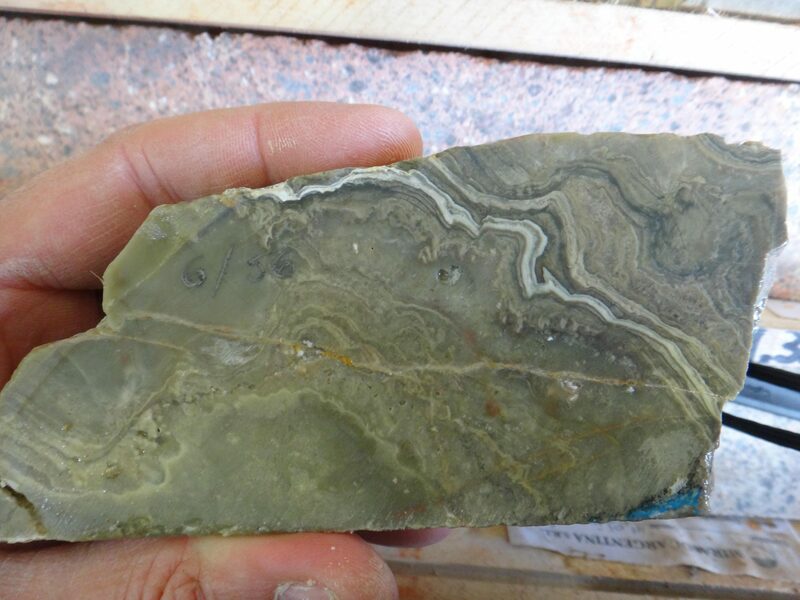 Select rock chip sampling of the veinlets has returned assays of up to 2.49 g/t Au and 8.3 g/t Ag (with the previous best rock chip assay at Themisto of 0.49 g/t Au and 3.6 g/t Ag). Outcrop is sparse, and existing electrical geophysics surveys do not extend into this area to guide exploration. However, the Mirasol ground magnetics show a large-scale NW- SE oriented fault hosting the veining, suggesting the potential for larger-scale vein development within the fault in this new portion of the Themisto Trend. 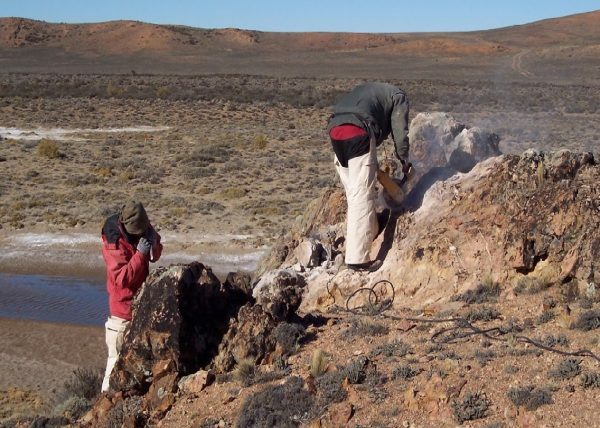 Reconnaissance of the Claudia Claims 7 km to the east of the Cerro Vanguardia Mine leases, the Volcan Prospect, has identified an area of sub-cropping epithermal vein trends that have to date been traced for 100 m before trending under gravel cover to the SE. 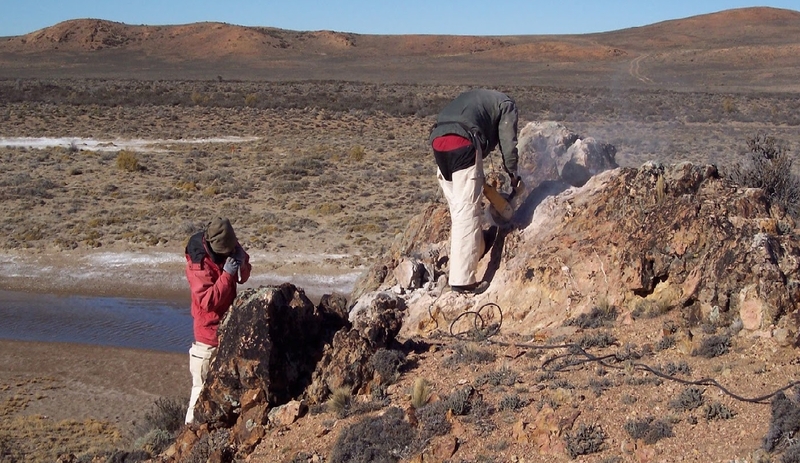 Rock chip assay results at Volcan have returned multiple Au+Ag anomalous samples with the best assay to date of 1.35 g/t Au and 14.3 g/t Ag for veins up to 0.5 m wide.